Phew. Well, that took rather longer than we wanted, but now we’ve picked up all the boxes and plugged them back together, so the Zopa goodness is back online, and better than ever. Let me break it down for you. Firstly, something of interest to everyone is that we’ve changed the way the matching engine works – click here to read a previous post about it. The upshot is that lenders will now receive exactly the rate they offer into the markets, and borrowers will pay a blended rate of all their lenders rates. This should give lenders better control over their returns, and borrowers a better rate for borrowing. You’ll notice 2 new columns – Offered Lower and Match Speed. Offered Lower shows you what percent of the money in that market is offered at a rate lower than your rate – a high percent means your offer is relatively un-competitive, a low percent says you’re near the head of the queue to get your money lent out. Match Speed gives an indication of how fast your money is likely to get lent out at the rate you’ve chosen. It’s based on comparing your rate to the previous 100 matches in the market. If it’s Low, you might want to reduce your rate to get your money lent out faster, if it’s High you should see you money get lent out rapidly – which will make everyone happy! 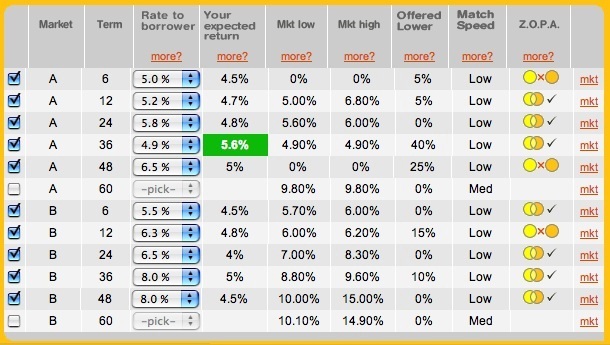 You’ll also notice if you click on the ‘mkt’ link at the far right you can now see all the offers in the market, ranked in the order in which a borrower borrows. You can see exactly how your offer compares to everyone elses. From this screen you can also see whether your offer is eligible for the Zopa Bonus – see this page for more information on how it works. If you are, your offer in the A 36 month market will be highlighted in green, if it’s not, and you’d be better offer with the bonus, it’s highlighted in red. Have a play, you’ll soon get the idea! What else? Well, several behind the scenes things that will come to fruition in the near future. We’re working on making it possible for borrowers to do all sorts of interesting things with their loans – giving them total control over early repayments, changing the term and making one off payments to reduce their outstanding amount. Today we gave that functionality to our admin team – in the future it’ll be a web screen that members can access – look out for it. Wowzers. If you’ve made it this far – you deserve a treat. 🙂 Click here for a nice little game. Oh – and Happy Halloween!